I have a fondness for detective stories set in Italy. For example, books by: Andrea Camilleri, Donna Leon, and a new acquaintance – Marco Vichi. These authors and their main characters love food and describe the Italian cuisine in a fantastic way.. In the Movie The Godfather there is a scene where one of the mafia guys demonstrates how to cook an authentic tomato sauce! Inspired by this I cooked my own version of tomato sauce. When the sauce is ready, pick out the garlic, onion and chilli. What dishes can you use the sauce with? The tomato sauce can be used for many dishes, and you can store it in the fridge for a few days. However, it can become watery in a lunch box, especially if it has been frozen. 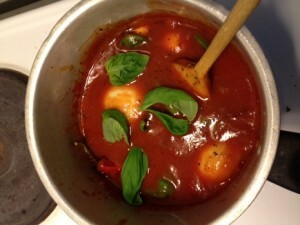 I usually use the sauce for spaghetti and meat sauce, My absolute favorite is to add gnocchi in a mold. Poor over the tomato sauce, sprinkle mozzarella cheese and stir then put it in the oven for 15-20 minutes! The sauce is perfect for children, family dinners or romantic dinners. 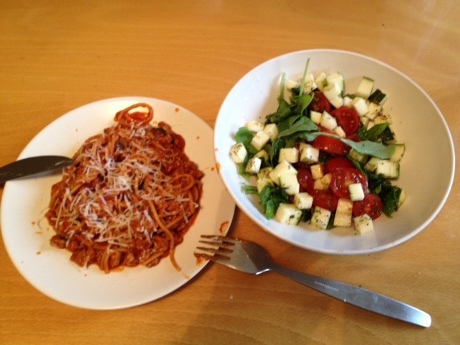 ….I had some cooked whole grain pasta left over and some minced pork meat for two people – perfect! All I had to do was to fry the minced meat. While i seared the meat I made a simple salad of zucchini, mixed salad, cocktail tomatoes, lemon, herb seasoning, salt, pepper and olive oil. When the meat was fried, I put the cooked spaghetti in the pan, poured the sauce and let it cook together. The sauce that was left I poured into a jar and put in the fridge, ready to be used in another dish!